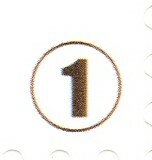 numbers and symbols indicating their franking value. Postage can be composed of several stamps of various denominations. Postage step 3 can e.g. be composed of a single 3-stamp, a 2-stamp + a 1-stamp or 3 1-stamps. prices, e.g. EUR 0.61 / 0.71 with the lower price being the discounted price and the higher the price of a single stamp.